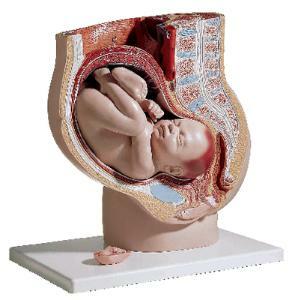 The Pregnant Pelvis Model is an accurate representation of pregnancy at three and nine months. A life-size pelvis, sagittally sectioned, shows the condition of the uterus and fetus during the ninth month of pregnancy. The dorsal and abdominal muscles with lumbar vertebrae and a kidney section are visible. The fetus can be removed for closer examination and can be replaced with the included three-month fetus insert for comparison.